In a Smoke-Filled Café . 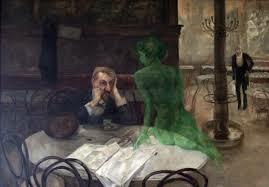 . .
What you are about to read might have been improved upon if I had been writing with la fée verde (the green fairy) looking over my shoulder. Or better yet, if I also was writing from a smoke-filled cafe in Paris. Or even better, from a smoke filled cafe at the turn of the 19th century, hanging out with the likes of Ernest Hemingway, Oscar Wilde, James Joyce, and Lord Byron. There’s a certain mystique with drinking absinthe, la fée verde, a distilled spirit concocted from various herbs which might include tansy, fennel, green anise, and bee balm. 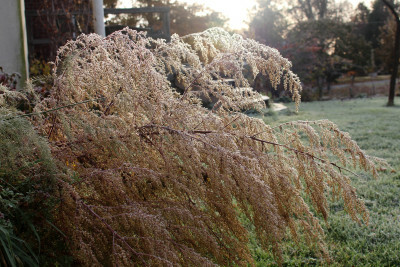 The most important ingredient is, of course, Artemisia absinthe, absinthe, the plant. Absinthe is one of many plants in the genus Artemisia, commonly referred to as mugwarts or wormwoods. The peaches on a friend’s tree were small, marred with bacterial spot disease, and still showed some green on their skins. So burdened with fruits was the tree that it had burst asunder from their weight, splitting one of the main limbs. Still, the friend insisted that the peaches tasted good. As further enticement, the tree had a history, having sprouted on the grounds of a nearby 18th century house that had an orchard. The tree was evidently cold hardy also. So I twisted one fruit off and took a bite. 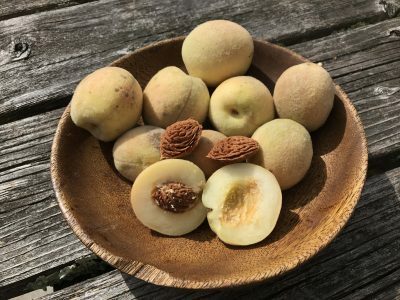 In spite of being not quite ripe, the fruit was delicious, quite sweet — as is usual with white peaches such as these — and with an old-fashioned, intensely peachy flavor.